I did it! 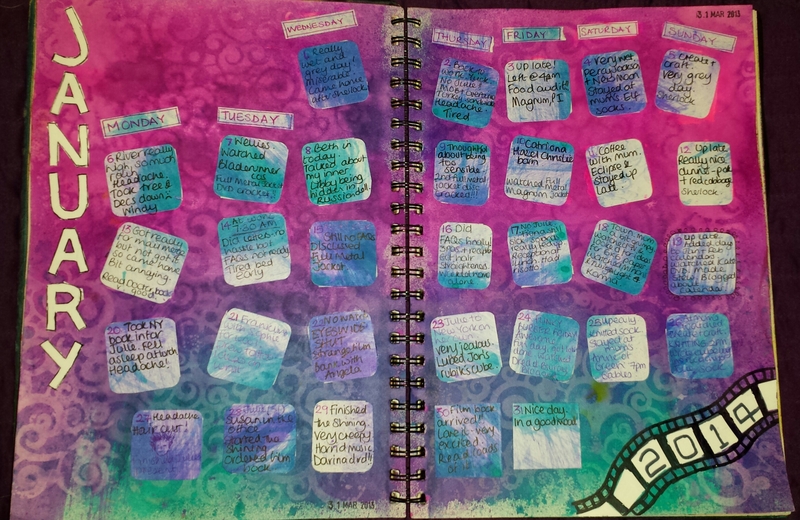 I finished my January page before the end of the month – just!! It’s not amazing but I’m pleased I did it. It’s better than last year as that didn’t happen at all. I’m determined to take part in the 365 Calendar challenge this year so I’m really happy that I haven’t fallen at the first hurdle, as it were. And for those of you that are interested I did manage to write the instructions for sewing a cube bag last weekend. The recipient of the present was extremely pleased with her kit and instructions! After she’s tried them, I will probably post them here for other people to use. I will need to take more pictures though. I was given the Doctor Who 50th Anniversary collection of books for Christmas, I never thought I would read a Doctor Who book but I’ve actually really enjoyed them. I love watching it but wasn’t bothered about the books. There are 11 in the collection, 1 for each regeneration of the Doctor (excluding John Hurt’s War Doctor) and I’ve read numbers 6 to 11 so far. I’m reading them in reverse order, working towards the ones that I remember least from the TV programme. A fair amount of Doctor Who knowledge is assumed, they don’t really explain who he is, or what the TARDIS is but if you have ever watched it, I can recommend them as a light read. Why do I have these stupid ideas? I have a friend who is very difficult to buy presents for so I usually make things as then I know she won’t have them. This year I’ve decided to give her a kit and now I have 2 days to write the instructions for making a cube bag like the one in my previous post!!! Aaargh why do I do these things to myself? I thought it was a brilliant idea but now I’m really not so sure. 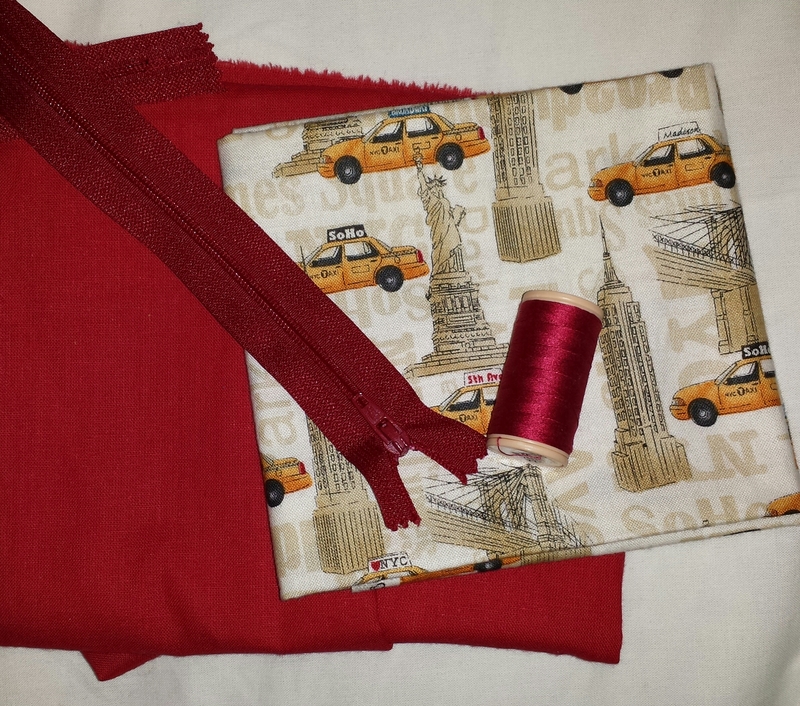 I’ve got some New York fabric, red lining fabric, a red zip and red cotton so I just need to package it in a nice way and write the instructions. Wish me luck!! Happy New Year!! I hope everyone had a lovely Christmas and New Year. Right time for an update on all things mixed media and arty. 2013 was a bit of a disaster from a creative point of view for me, I didn’t do a single month of the 2013 Calendar Challenge and only made a few birthday cards. I did do some knitting and sewing but I didn’t play as much with paint and inks as I wanted to, so this year I’m determined to make up for it. 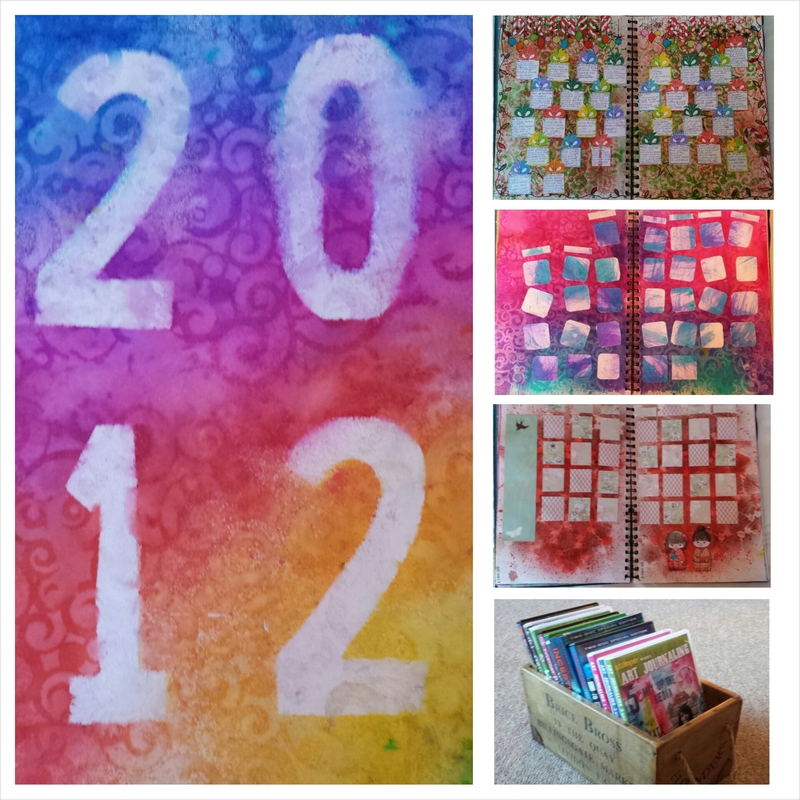 I got Kate Crane’s Art Journalling 5 & 6 dvds for Christmas and I finished watching them today. Watching Kate make a junk journal using bits of cardboard, tags and other junk inspired me to finally sit at my desk and have a play myself. So here we are with January and February 2014 pages in progress. I used Japanese style papers for the days on February as I thought I should use them. I’m very good at buying paper pads and then just looking at them, in 2014 I plan to use some of my stash of craft goodies – yarn, fabric, paper, ink, paint, ribbons the whole kit and caboodle. The Brice Bross box was a present from mum, it’s my surname and she thought it would be useful for storing crafty bits in. I’ve put it by my tv for the current dvds that I’m watching/going to watch. I googled Brice Bros and it turns out it was a real fishmongers in Billingsgate Market in London. Dad’s family is from Kent so they could even be related to us. 2013 sewing: Veil for my best friend’s wedding, laptop sleeve, snowman decoration, owl cube bag, felt bird decoration, Japanese owl, shortened two pairs of pyjamas and customised some shorts to go to see The Rocky Horror Show. 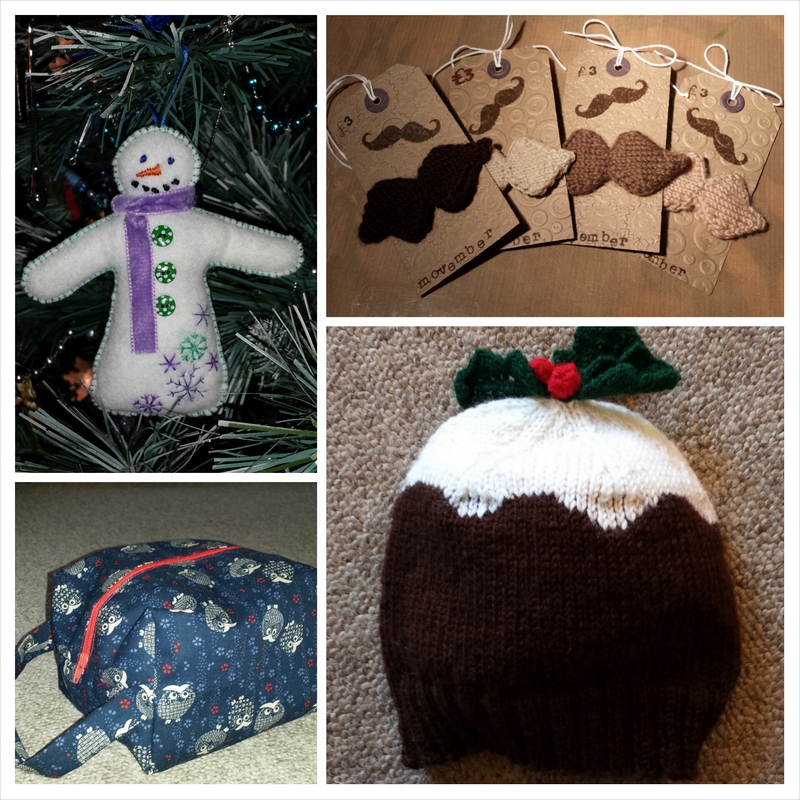 2013 knitting: Camelot shawl, teal socks, Calorimetry hat, Smockie dress, Christmas Pudding hat and knitted moustaches for Movember. I also made some Alice In Wonderland themed stitch markers for my friend Alice, Japanese lino cuts that turned out quite useful for embossing paper in my cuttlebug. I’m really proud of the knitted moustaches as I raised £35 for Movember by selling them to the girls in the office so that they could participate too and it was great fun. Becky loved her wedding veil and wore it all day. But I’m NEVER making another one (sewing netting to a hair band is the most frustrating thing I have ever done and I was up until the wee small hours getting it done) it was so lovely seeing her wear it when she got married. 2014 is looking like it will be quite difficult at work (they have announced that the business will be closing in 2015) so I need to be creative outside of work even more to balance my life out. I don’t really make new year’s resolutions but my plans for 2014 are to spend more time making art and playing with inks/paints and to have more fun! !